It’s no secret I love desserts, always have. But most of the desserts I love aren’t all that rich or overly sweet. I’m weird that way—I’ll pass over fudge, red velvet cake, and store-bought brownies to get to lime cookies, peach ice cream, and dark chocolate cake. People think I’m weird, but that may be a function of how I grew up. Due to a preponderance of diabetes and such in my extended family, my mom and aunts have tweaked a lot of our family recipes over the years, making them healthier. This includes things like using whole wheat flour (which—let’s face it—we were on a wheat farm, so that just made sense) and substituting honey for sugar and oil for butter or shortening. 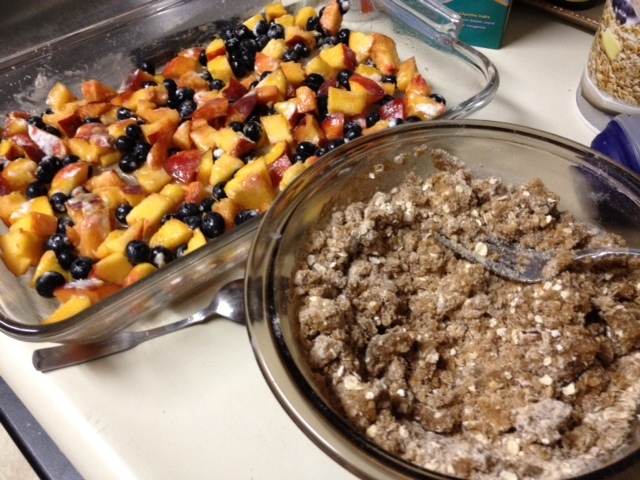 I have no idea exactly when this healthy fruit crisp recipe evolved to this point, but it’s been one of my summer go-to desserts for years. 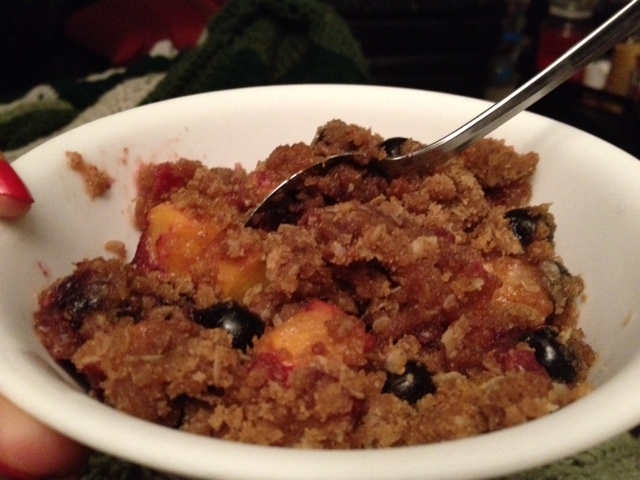 My mom tends to make it with apples, sometimes cherries, but I’m partial to peaches. 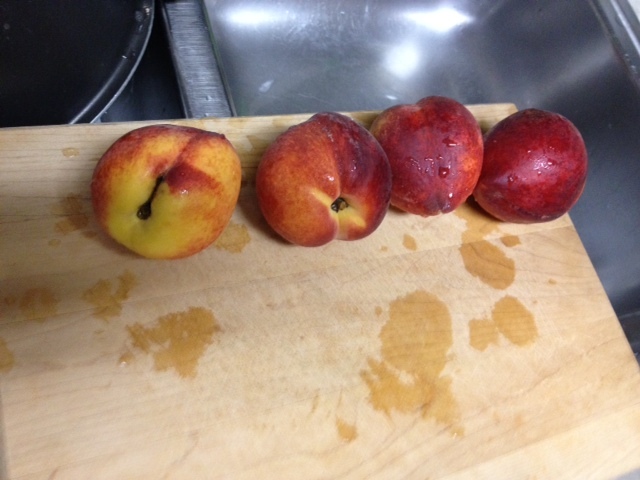 Ripe, juicy, Southern peaches. Isn’t this picture the perfect encapsulation of summer?! You definitely want to make sure you have good, ripe peaches—none of that mealy nonsense. The quality of the peaches make all the difference. 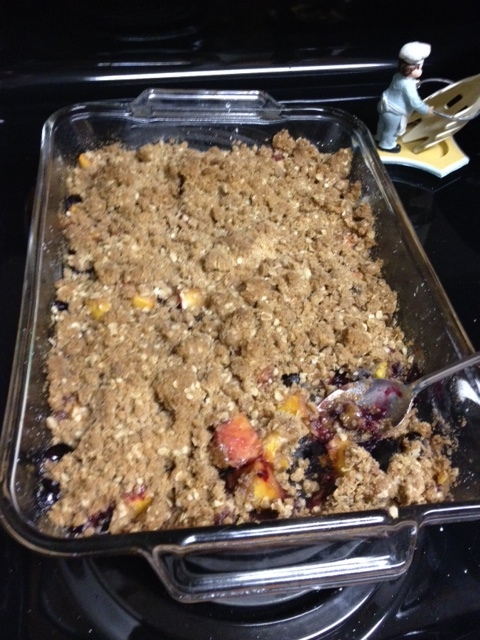 And since I had a bunch of blueberries from the farmer’s market, I threw those in too. Spray the 9×13 (or 9×9 if you’re going that way) with non-stick spray. 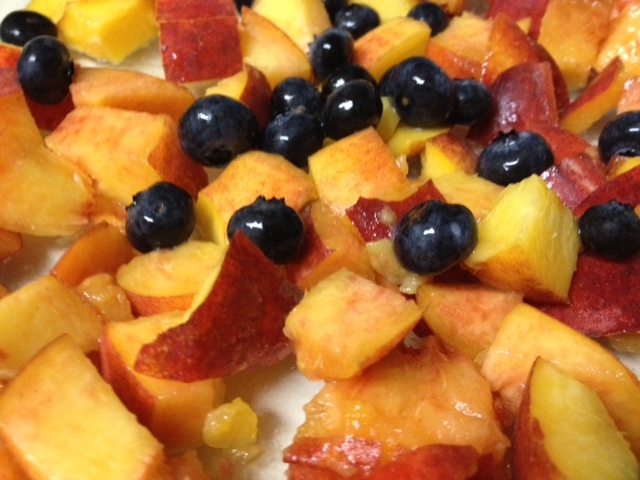 Chop up the peaches into bite-size pieces, spread in the pan. Sprinkle in the blueberries, if you’re using them. Sprinkle some cornstarch on the fruit, as well as some cinnamon. Sprinkle a few tablespoons of water throughout the pan, and drizzle a tiny bit of honey and lemon juice. 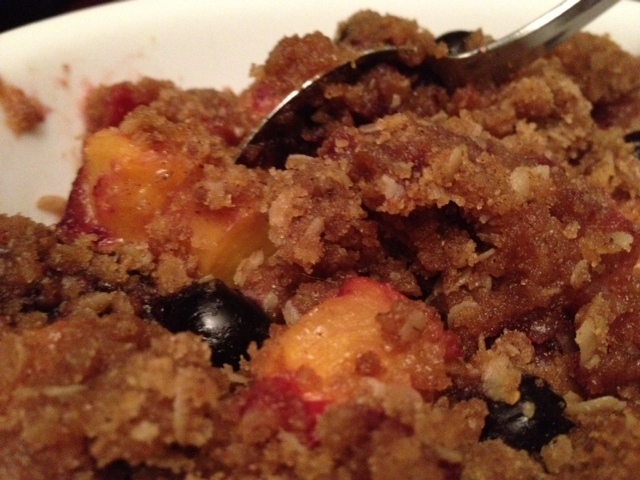 That’s the beauty of this recipe…besides the streusel topping, it doesn’t need sweetened. 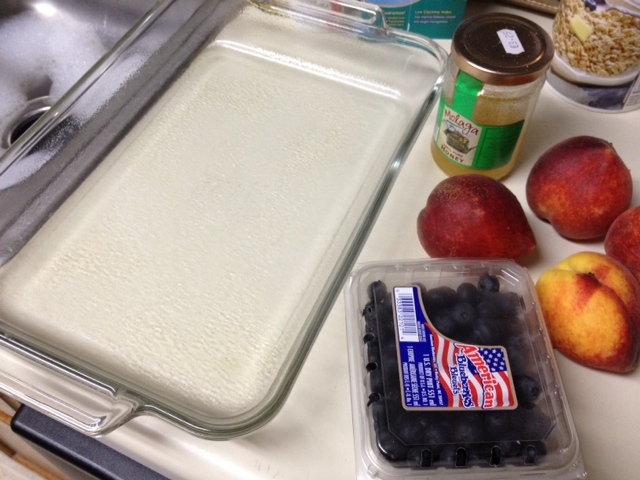 Stir the fruit/cornstarch/liquid mixture up a little. 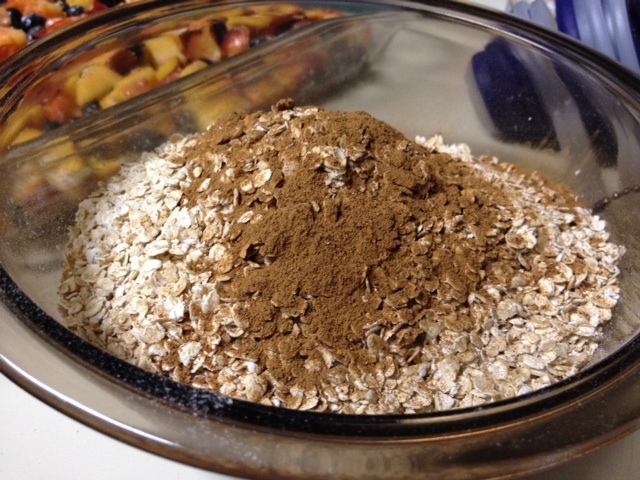 To prepare the topping, put the flour (I used whole wheat), brown sugar, and oats in a bowl. Pour in the oil. Original recipe calls for softened butter, but it’s great with oil and a little healthier. 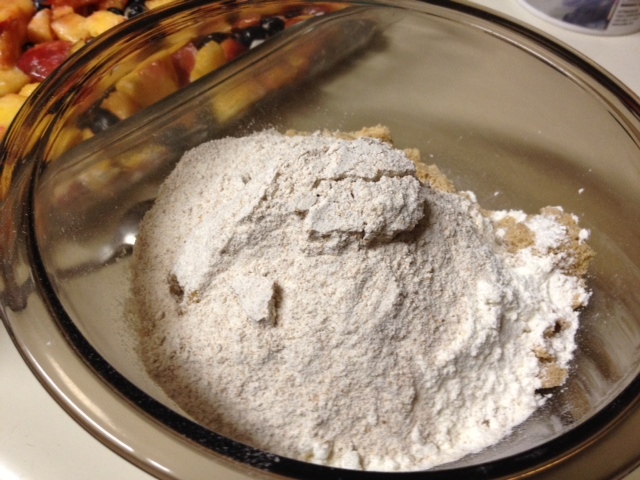 Mix the streusel together with a form until it’s crumbly or clumpy. 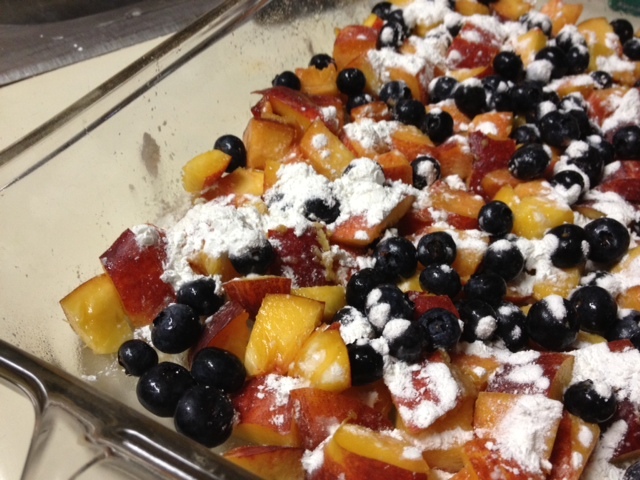 Sprinkle the topping over the fruit evenly. You want to make sure big pieces of fruit aren’t exposed, because it can make the fruit lose its moisture. Bake for about half an hour. 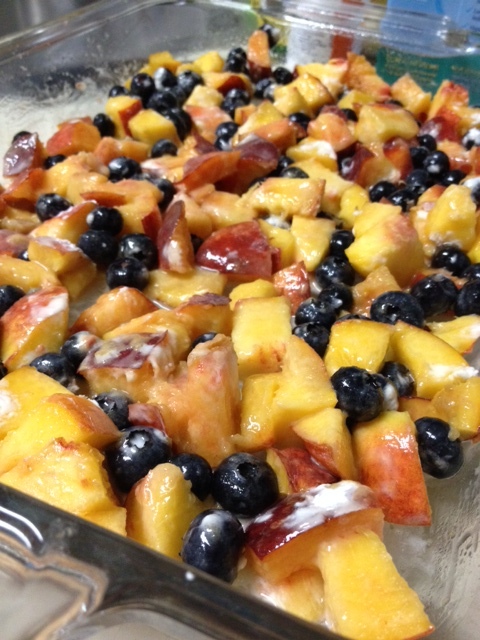 You’ll want to the topping to brown on top a little, and the fruit mixture to be bubbling. Serve hot or cold. I immediately dip up a bowl and throw it in the freezer. My mom serves it hot with vanilla ice cream. Makes for a great summer (or winter) dessert. 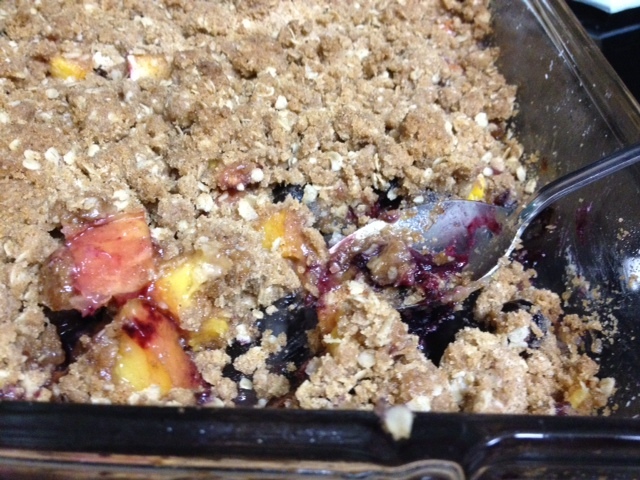 Doesn’t have to be peaches, you can use whatever—my mom makes apple crisp all the time for my grandpa, who’s diabetic. 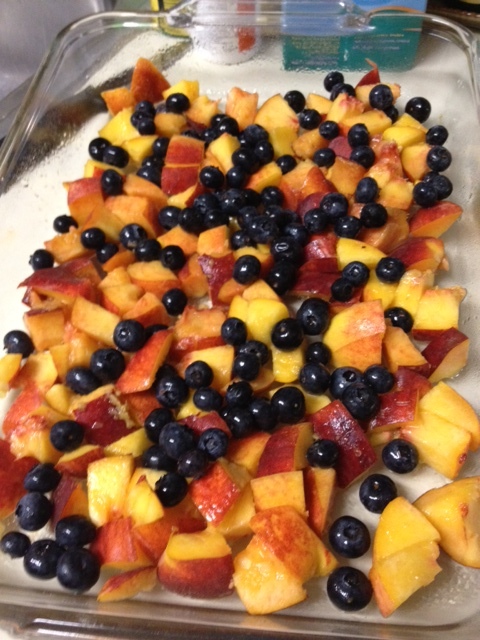 Spray a 9×13 pan with cooking spray and preheat the oven to 375 F.
Cut up the peaches and spread in the pan with the blueberries. Toss with the honey, cornstarch, lemon juice, cinnamon, and water (to taste). I usually stir with a spoon to coat everything. 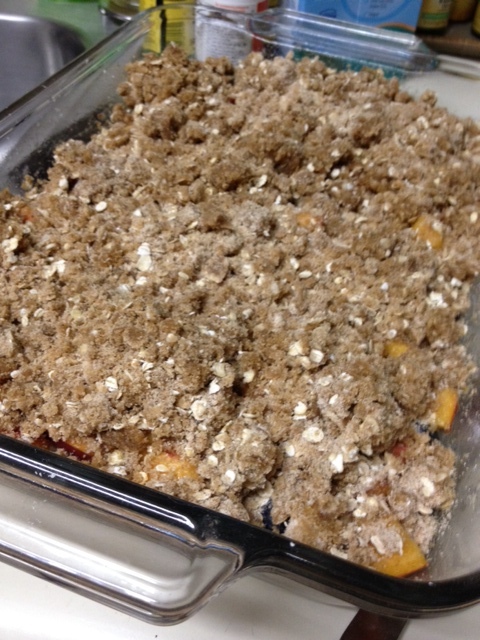 Mix the ingredients for the topping, cutting in the butter or just stirring in the olive oil til big crumbles form. 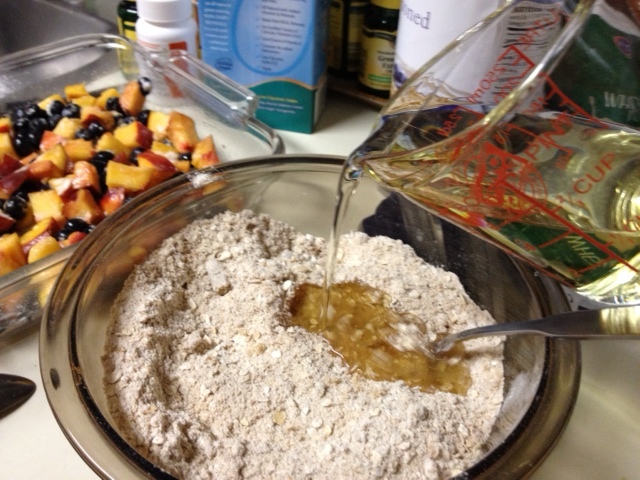 Sprinkle the topping over the peach mixture. Bake at 375 F for 30 minutes or until browned. Ha! Most of my family would agree with you…I tend to be the weird one about that.